The Life Sciences Scotland Industry Leadership Group (LSS ILG), is a joint industry, enterprise of agencies and government strategy teams. Their remit is to develop, drive and deliver the Life Sciences strategy in Scotland. By developing an environment where ingenuity and innovation can create jobs and wealth for Scotland, they aim to benefit the global community. It fosters support and discussion between key players in the Life Sciences sector and those responsible for government policy-making to ensure Scotland has the best possible environment for fledgling technologies and established players. The LSS ILG is chaired by Dave Tudor, VP, Primary Supply Chain at GSK and co-chaired by Paul Wheelhouse, MSP, Minister for Business, Innovation and Energy and supported by Ms Aileen Campbell MSP, Minister for Public Health and Sport. LSS is a group of individuals who are committed to developing the Life Sciences sector in Scotland. 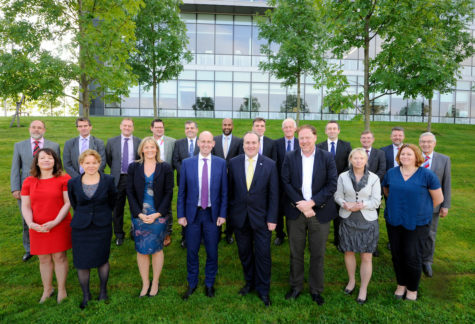 The LSS ILG consists of senior representatives from stakeholders across the spectrum of the Life Sciences community: CEOs and Directors from pharmaceutical, biotechnology, medical devices and diagnostics companies; research organisations and academic institutions; Scottish Enterprise, Highlands and Islands Enterprise, the Scottish Government and Scotland’s National Health Service. The LSS-ILG has focused on tackling key issues important to the sector and industry. Theme subgroups across Business Environment, Innovation and Commercialisation, Sustainable Production and Internationalisation with additional representation from colleagues across the sector have come together to address these challenges.